Posting this for Cash Fordyce SASS # 28950. His health is forcing him to give up CAS and a couple of us are helping him sell is CAS firearms. 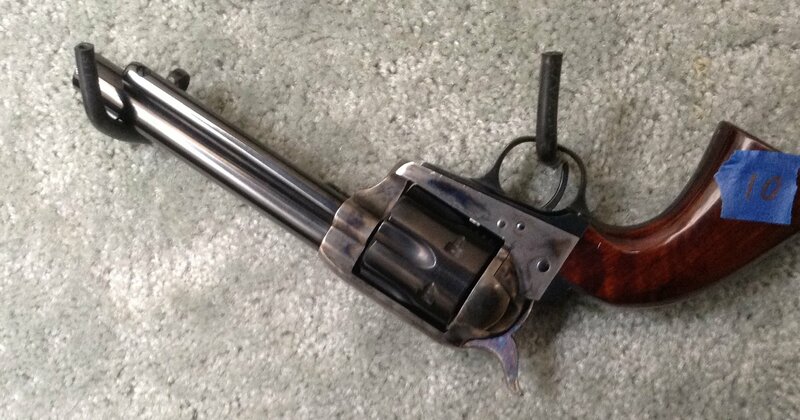 This is a matched set of revolvers with consecutive serial numbers, CCH black powder frames, walnut grips, bullseye ejector rods. Cody Conagher action jobs. These are super slick and smooth. $1300.00 plus shipping for the pair. You'll be dealing with Cash Fordyce directly, PM me for Contact info. I think I know the answer but want to make sure... Do these have the older 4-click hammers with no safety, or the 4-click hammers with the block safety, or the new 3-click hammers? Also is there any chance of a face to face transaction at Comancheria Days on April 12-13th? If a face to face transaction at the Texas State shoot in Comfort in not possible how much for shipping? I sent you a PM with the Contact info to confirm how the pistols function. I also have a person that can deliver them to Comancheria Days. Is there some reason you don't share that information of the function of the hammer's? It would probably help with your sale. Just a note that may help here. The Black Powder frame guns from Cimarron do not have the retractable firing pin, "3-click" hammer. I don't have the pistols in my possesion. Saturday I am going to see Cash and I'll confirm the operation and post it for everyone's benefit. IAW wire guidelines I am just posting them for Cash. The pistols are his and in his possesion. Got to actually inspect the pistols today and they have the older older 4 click hammers with no safety. Did the cut the forcing cone or adjust windage if needed? These are 4 click colt style hammers, no safety block or anything? I dont see it but are they uberti or san marco? 4 click. No safety blocks of any kind. I’ll have to ask if the forcing come have been touched. From a rest they shoot dead on at 25 yards.